Look up the word “indomitable” in the Oxford English dictionary and next to the definition you’ll probably see the smiling face of Lassana Diarra, such is his skill at overcoming setbacks that would wreck the career of many a professional footballer. Indomitable: –adjective- that cannot be subdued or overcome, as persons, will, or courage; unconquerable: ie. The warrior was indomitable like Lass. Things looked to be rosy for Lassana in 2005 when Chelsea signed him for £1 million, citing him as “the next Claude Makelele” but things never worked out for Diarra, and he moved to Arsenal in 2007. Diarra found it tough at Arsenal too, his path to the first team blocked by both Fabregas and Flameni, and Diarra was eventually shipped out to Portsmouth. This period of time was crucial for Diarra, after failing at two English clubs he had to make it big for Portsmouth- and by George did he do just that. After playing a crucial role in Portsmoth’s shock FA Cup triumph, Diarra started the 2008/2009 with the heavy expectation of the city of Portsmouth on his shoulders. The Pompey faithful were delighted at the fact that he had rejected to engage in transfer rumours linking him with clubs such as Aston Villa and Tottenham Hotspur, and saw Lassana as a crucial figure in their dreams of success. The season begun on a slightly negative note for Diarra, as he missed a penalty in the Community Shield penalty shoot out and watched his team lose to Manchester United, but the defensive midfielder soon bounced back. Diarra netted Portsmouth’s first ever goal in a major continental competition and performed consistently for Portsmouth through the Harry Redknapp- Tony Adams managerial switch around. However many knew that, with Harry gone, keeping Diarra at Portsmouth would be a massive task. “The people at Portsmouth know that I will not spend my life at the club.” So said Lassana Diarra after signing for Portsmouth. And from that day forward, people were left in little doubt that Diarra would accept the first big offer that came in. So when Real Madrid’s £20 million offer was accepted by Pompey, the fans seemed resigned to the news. Diarra had played out his heart for Portsmouth and, ironically, that came to be as much of a blessing as a curse for the club. 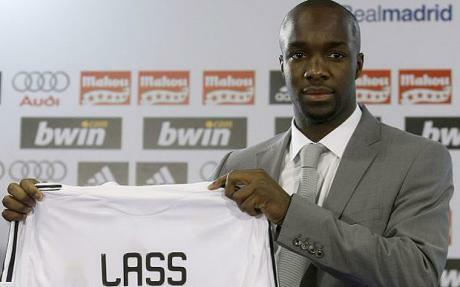 On the 22nd of December, Lassana Diarra became Lass, the new kingpin of the Real Madrid midfield. Diarra immediately got to work in the heart of the Madrid midfield. Lass became a prominent figure in the Madrid team since his arrival mid-season, making 19 La Liga appearances and 2 Champions League appearances. Diarra is yet to score for Madrid, but his solid performances have made him a favourite with the fans, and he has rapidly become one of Real’s most influential players. Lassana also had a good season for the French national team, cementing his place in the middle of the park for Les Blues. Diarra has featured in the 2010 World Cup qualifiers, and has played in the majority of France’s international friendlies. With the retirement of Claude Makelele and Patrick Viera close to hanging up his boots, Diarra is not far off from becoming France’s first choice midfielder. With Real Madrid splashing out in the 2009 Transfer market, you could forgive many a Madrid player for feeling a little bit worried about their future at Madrid. But it seems that Lassana shouln’t worry. He has proved his calibre at Real Madrid, and in the season to come he has a wonderful opportunity to assert himself as one of the world’s best defensive midfielders. He is the Best player in the RM squad.